Anita used (I think) stamps meant to look like watercolour strokes, so I blended ink and then added water droplets for interest and texutre. My colours turned out a little softer and dreamier, so I made my black element smaller. Fabulous take on the muse card, loving that you softened the colors. 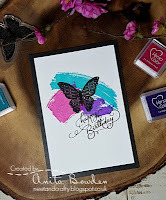 Gorgeous card Miss Ardyth...love your soft sweet colors. Another beautiful card! Love the softness of the colors. Thanks for sharing. Gorgeous take on Anita's card, Ardyth! 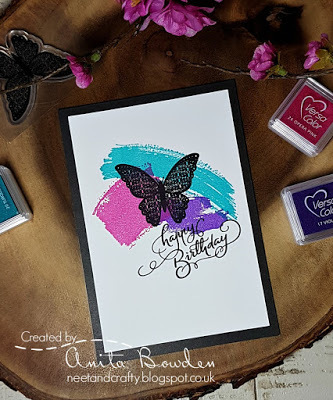 I love this pretty stencil and how you used the pastel version of her color palette...so lovely!